To realize the full benefits of strengths, it is critical that you focus on developing them completely. 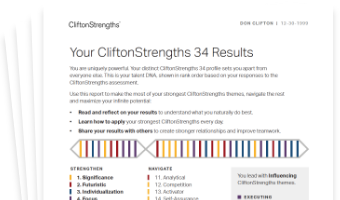 Partnering with a Gallup-Certified Strengths Coach can be the difference between simply knowing your strengths and truly living a strengths-based life. The coaches listed here are recognized by Gallup as being fully qualified to coach others using strengths-based development. Find a coach that best suits you and your needs, and contact him or her to begin the next chapter in your strengths journey. Search our full list of Gallup-Certified Strengths Coaches. Find the right coach to help you overcome challenges and set and achieve great goals.